Director Mikhail Red's first foray into the horror genre shows there's always something to fear in the dark. 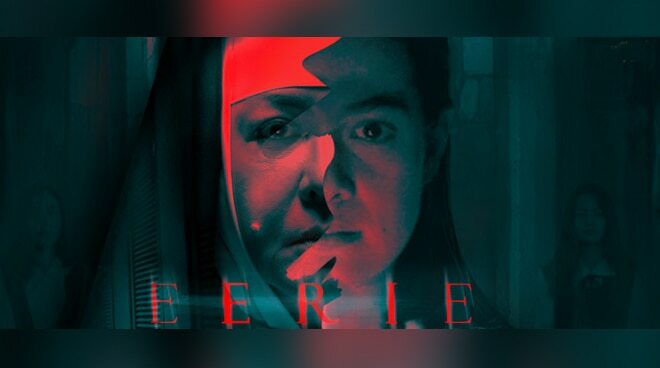 After making local film history as the first Pinoy horror film to have an international premiere in Singapore which was held last December, Mikhail Red's first horror film project Eerie finally opened in theaters this week, raring to provide a new kind of scare amidst the old school vibe of an ‘90s all-girls Catholic school. Bea Alonzo plays school guidance counselor Patricia Consolacion, a deeply caring individual with a painful past that has made her want to become a savior of sorts to all the students that come to her office for help. After some consecutive unexplained occurrences during ungodly hours and elderly school caretaker Fidel Cariaso gets blamed for a murder on the campus, Pat devotes her time after work to dig even deeper into what is really happening in the dead of the night. When the very emphatic Bea Alonzo sets off to investigate what is causing distress among the students, she ends up forming an unexpected friendship with someone from the undead in the process who may or may not help her find the answers she seeks. Charo Santos makes her horror comeback as school principal Sor Alice, a strict and imposing headmaster who will not hesitate to inflict corporal punishment when she sees fit. She and Bea's character end up butting heads when more unexplained things happen and she shows more concern in preserving the school's pristine image rather than the safety of the students. Eerie's production design makes excellent use of the darkness and images of religious relics to add to the haunted feel meant to amplify the scare factor inside the Sta. Lucia Academy for girls. Effective timing in musical scoring will bring in more than a few screams from the audience. While the setting provides a great scary atmosphere, there were some points which made it unnatural, like the lack of lighting for a campus experiencing unusual events which would have normally called for more vigilance from school security or administration. Overall, Eerie is a film out to provide thrills and scares aplenty. With excellent performances from two actresses known for their acting skills, audiences will be taken on a thrilling and terrifying ride.